My mom had this tree in her kitchen at Christmas time for years and now it's in my sewing room for the holidays. It's a "half" tree...the kind that is flat on the back to hang on the wall. Well, I don't have one square inch of wall space left in my sewing room, so I hung it from a wreath hanger on the door. 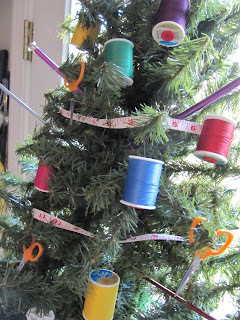 Thrifty me didn't want to buy small ornaments for it, so what do I have hanging around my sewing room that's colorful...THREAD!!! For this quick project, you will also need some buttons and thin wire and colorful spools of thread. 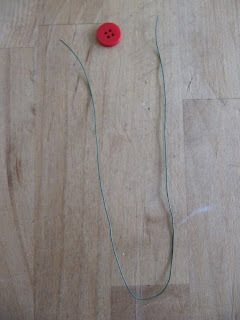 Take a piece of wire about 12 inches long and fold it in half. thread the 2 ends of the wire through 2 of the button holes. push until button reaches the folded end. Now insert the 2 ends of the wire into the bottom of the spool of thread. pull until the button is on the bottom. 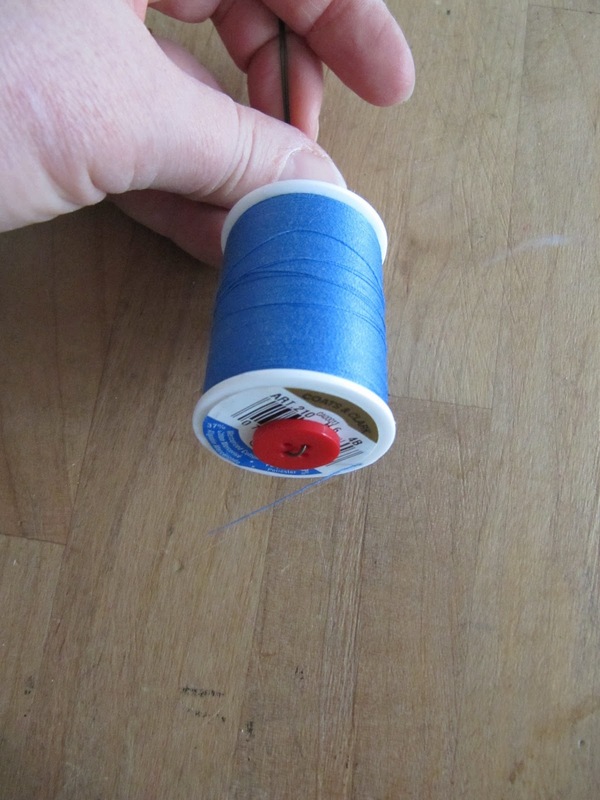 separate, then twist the ends to create a loop. All set to hang on the tree...should have added a pretty ribbon, but wasn't thinking! Add one of the many tape measures we all have hanging around as a garland, my moms knitting needles and those cheapo plastic scissors that come in sewing kits. I had the scissors from another project years ago. 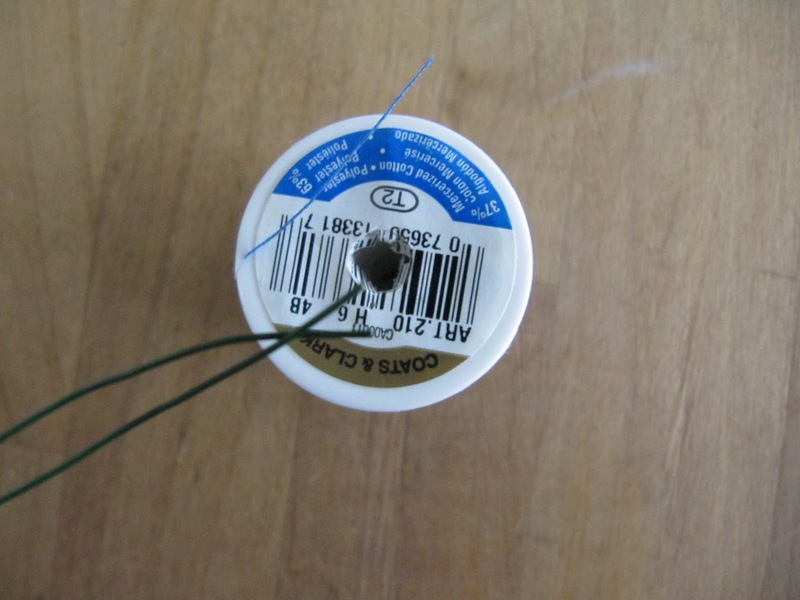 I needed parts of the sewing kit, but not the scissors. I knew they would come in handy some day. This is why I save useless crap! 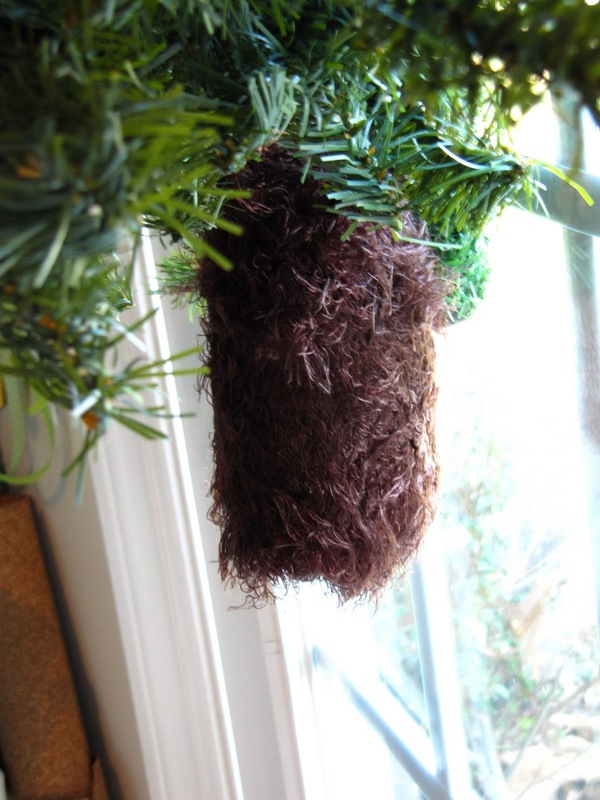 The tree is old so the trunk was missing...hmmm what's brown around here. 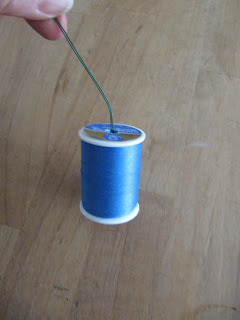 Ahh, yarn that I'll never use, because I can't knit a stitch! 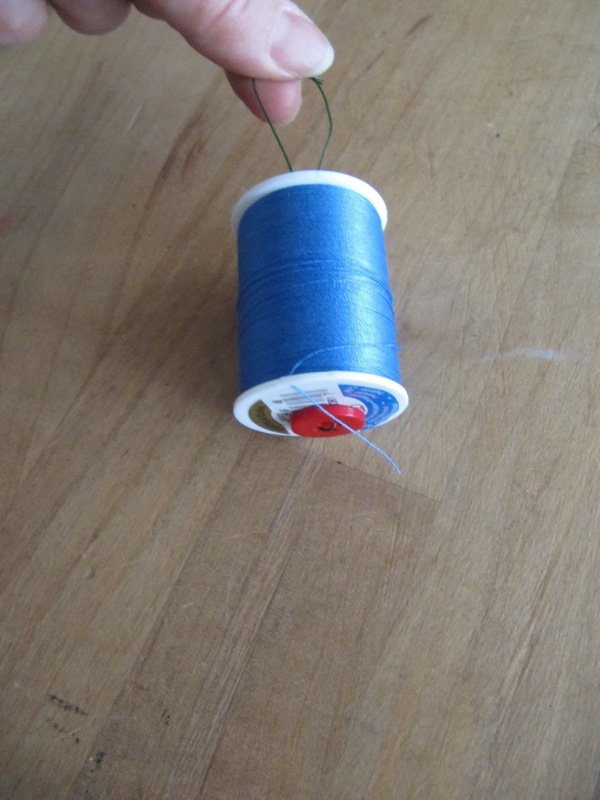 See, it's not even called a stitch...it's a purl. Take the wrapper off and its the perfect trunk. Although, I think I like the wrapper on! Hard to get a good picture with the bright sunlight behind the tree from the door. It needs a little something more for a filler, but for now it's good to go. 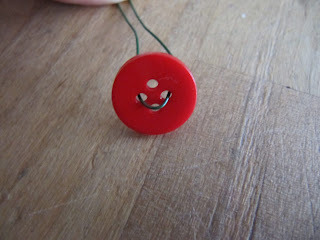 I'm sure we can all find something in our craft supplies or sewing things to decorate our little spaces. 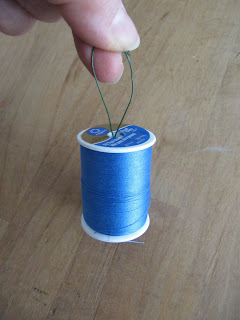 If there isn't room for a tree, how about adding the thread to a wreath!!! Hope you can add a little Christmas cheer to your hobby space. So here I sit at 12;48am giggling and clapping. You are just too funny, Karen. Love your tree! WOW what a neat idea. The tree and the decor. YOU are so good at this. Love it. I love your "New" tree. As I was looking through the post I kept thinking where is the gingham ribbon bows. Thank you so much for your many ideas. my word, that is one of the cutest trees i have ever seen, thank you for sharing! What a cute way to decorate a tree! 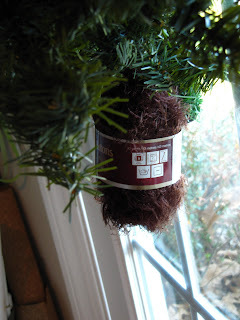 so cute... Like you I dont have room for a tree in my sewing room so I hang one upside from the ceiling. 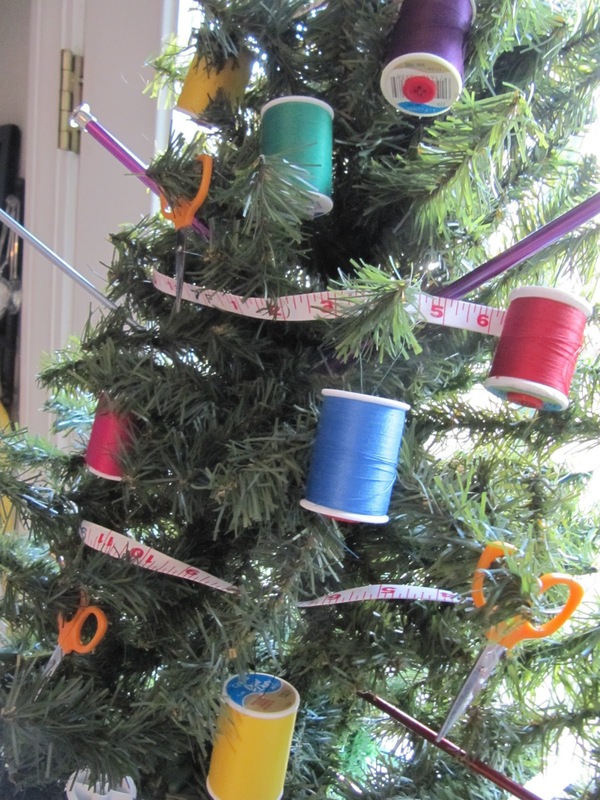 I have had a tree in my sewing room for about 8 years and it is full of sewing and quilting themed ornaments -- I just love it!! I made a garland out of buttons for it. 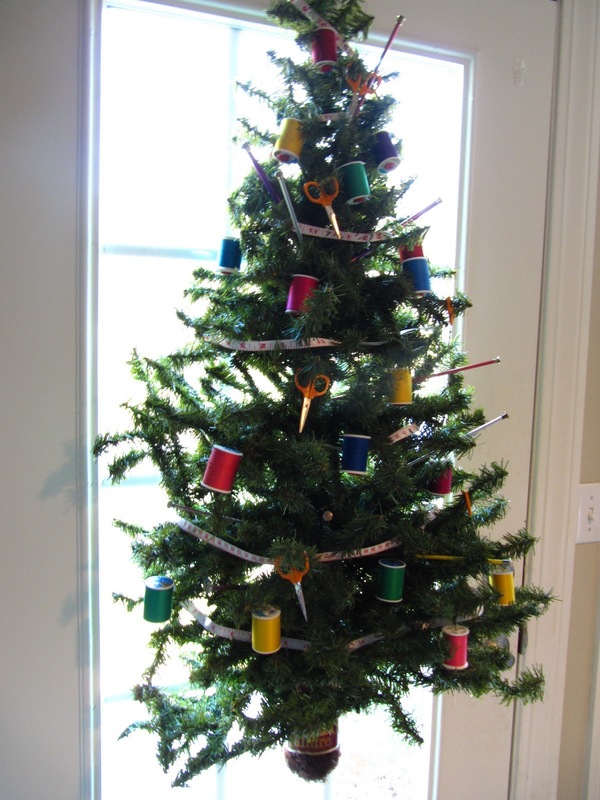 Your tree is a great idea too! Tooo dog gone cute!! I love it, you are inspiring me to put up a tree. My favorite has to be the santa tree though. A-door-able! Sorry, couldn't resist the pun. I LOVE this idea. 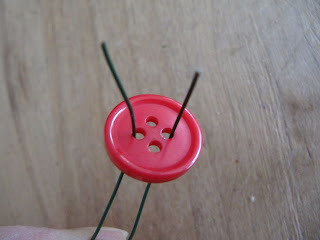 Great tutorial for the button and wire hanger! I am in WOW mode! That is so cute. Not this year......but I'm filing it away for next year. Your tree is great! Love it! 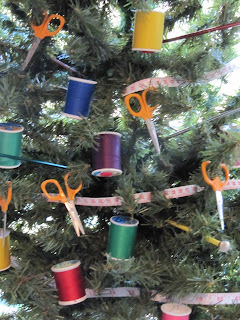 My lqs recently made a charity tree for the local tree pageant, and the garland they made was from a string of fabric yo-yo's, mini ones about 1-1/4" round, red and green small buttons sewn on the middle with a little tied bow of red and green pearl cotton cord. Adorable! 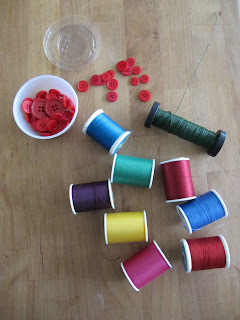 I'm thinking I need a wreath with spools in my sewing room now! Thanks! And have a very merry Christmas! What a unique tree! I love what you have done. Very clever of you. Where in the world do you get a half-tree? I'd love to have one. I have never heard of a flat sided tree. That's a great idea! It's so cute! Whta a great tree, I've never heard of a half one. Es la primera vez que veo un árbol de navidad con un costado plano. Y los adornos hechos con los carreteles de hilo me parecen muy originales. Espero tu visita en mi blog. So so cute!! Love this idea! Your creativity is amazing! I love your tree and I think a lot of us will be inspired to creat our own tree now. Thanks for sharing! also love your blog and go here often. 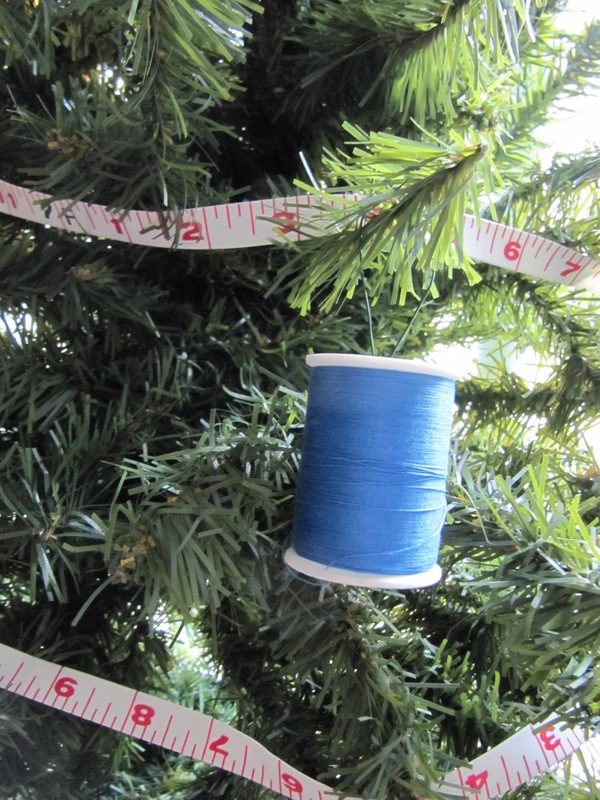 Plan to use at least 10 special themed ornaments for every 2 feet of tree.